One of the easiest and inexpensive way to control stepper motors is to interface L293D Motor Driver IC with Arduino. It can control both speed and spinning direction of any Unipolar stepper motor like 28BYJ-48 or Bipolar stepper motor like NEMA 17. If you want to learn the basics of L293D IC, below tutorial is invaluable. Consider reading (at least skimming) through this tutorial first. As L293D IC has two H-Bridges, each H-Bridge will drive one of the electromagnetic coils of a stepper motor. In our first experiment, we are using 28BYJ-48 unipolar stepper rated at 5V. It offers 48 steps per revolution. Before we start hooking the motor up with the chip, you will need to determine the A+, A-, B+ and B- wires on the motor you plan to use. The best way to do this is to check the datasheet of the motor. For our motor these are orange, pink, blue and yellow. Note that we will not be using the common center connection(Red) in this experiment. The center connection is merely used to energize either the left or right side of the coil, and get the effect of reversing the current flow without having to use a circuit that can reverse the current. The connections are fairly simple. Start by connecting 5V output on Arduino to the Vcc2 & Vcc1 pins. Connect ground to ground. You also need to connect both the ENA & ENB pins to 5V output so the the motor is always enabled. Now, connect the input pins(IN1, IN2, IN3 and IN4) of the L293D IC to four digital output pins(12, 11, 10 and 9) on Arduino. Finally, connect the stepper motor’s wires A+ (Orange), A- (Pink), B- (Yellow) and B+ (Blue) to the L293D’s output pins (Out4, Out3, Out2 & Out1) as shown in the illustration below. In our next experiment, we are using NEMA 17 bipolar stepper rated at 12V. It offers 200 steps per revolution, and can operate at 60 RPM. Before we start hooking the motor up with the chip, you will need to determine the A+, A-, B+ and B- wires on the motor you plan to use. The best way to do this is to check the datasheet of the motor. For our motor these are red, green, blue and yellow. The connections are fairly simple. Start by connecting external 12V power supply to the Vcc2 pin and 5V output on Arduino to the Vcc1 pin. Make sure you common all the grounds in the circuit. 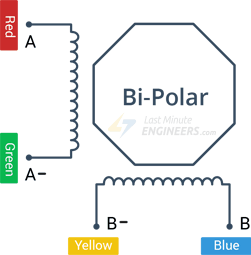 Finally, connect the A+ (Red), A- (Green), B+ (Blue) and B- (Yellow) wires from the stepper motor to the L293D’s output pins (Out4, Out3, Out2 & Out1) as shown in the illustration below. 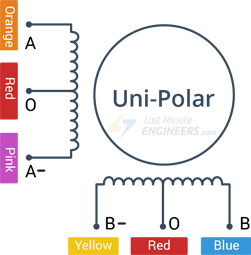 The following sketch will give you complete understanding on how to control a unipolar or bipolar stepper motor with L293D chip and is same for both the motors except stepsPerRevolution parameter. After including the library we define a variable named stepsPerRevolution. As the name suggests it’s the number of steps per revolution that our motor is rated at. Change this parameter as per your motor’s specification. For example, for NEMA 17 set it to 200 and for 28BYJ-48 set it to 48.